In the New Mexican town of Sinola in the early 1900s, Joe Kidd (Clint Eastwood), a disaffected former bounty hunter, is in jail for hunting on Indian land and disturbing the peace. Mexican bandito/revolutionary Luis Chama (John Saxon) has organized a peasant revolt against the local landowners who are throwing the poor off their ancestral lands, and raids the town's courthouse. A posse is formed by wealthy landowner Frank Harlan (Robert Duvall) to capture Chama. Kidd is invited to join, but declines. Harlan persists and Kidd relents when he learns that Chama's band has raided his own ranch and attacked one of the workers there. The posse is made up of numerous ruthless men, some of them armed with new-style rifles that have a much greater range than previous types. The posse rides into a village near Chama's hideout and forces the villagers into the church at gunpoint. They threaten to kill five Mexican hostages unless Chama surrenders. Harlan no longer trusts Kidd, and throws him into the church too, to prevent him from helping Helen, a female captive who unbeknownst to Harlan is also Chama's lady love, and the other Mexican hostages. Kidd manages a daring escape. He saves the hostages by finding Chama and his associates and forcing them to comply with his wishes. He lets Harlan and the posse know he will deliver Chama to Sheriff Mitchell (Gregory Walcott) in town. The posse pursues Kidd and his party, and a running gun battle ensues with the high-powered rifles. When Kidd and the captured Chama arrive in town they discover Harlan is already there with the rest of the posse survivors, planning to kill them all. Regardless, Kidd intends to go through with his plan. To get to the jailhouse, Kidd drives a steam train through the town saloon. A gunfight ensues between Kidd and Harlan's men. Kidd triumphs over the other men, and manages to kill Harlan in the courthouse by hiding in the judge's chair. Chama then surrenders to Mitchell. Kidd punches the sheriff (because the sheriff had punched him during the poaching arrest), collects his things and leaves town with Helen. Sets on the Old Tucson Studios outside Tucson, Arizona. Eastwood was given the script by Jennings Lang, written by novelist Elmore Leonard. 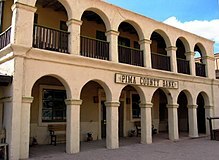 Originally called The Sinola Courthouse Raid, it was about a character inspired by Reies Tijerina, an ardent supporter of Robert F. Kennedy, known for storming a courthouse in Tierra Amarilla, New Mexico in an incident in June 1967, taking hostages and demanding that the Hispanic people have their ancestral lands returned to them. Leonard depicted Tijerina in his story, a man he named Luis Chama, as an egomaniac, a role which went to John Saxon. Robert Duvall was cast as Frank Harlan, a ruthless land owner who hires Eastwood's character, a former frontier guide named Joe Kidd, to track down the culprits and scare them away. Don Stroud, who had appeared alongside Eastwood in Coogan's Bluff, was cast as another sour villain who encounters Joe Kidd. With John Sturges directing, who had previously directed such westerns as Gunfight at the OK Corral The Magnificent Seven (1960) and Hour of the Gun (1967), filming began in Old Tucson in November 1971, overlapping with another film production, John Huston's The Life and Times of Judge Roy Bean, which was just wrapping up shooting. Outdoor sequences to the film were shot near June Lake, California, east of Yosemite National Park. The actors were initially uncertain about the strength of the three main characters in the film and how the hero Joe Kidd would come across. According to writer Leonard, the initial slow development between the three was probably because the cast were so initially awestruck by having Sturges direct that they surrendered authority to him. Eastwood was not in perfect health during the film, suffering from symptoms that suggested a bronchial infection, in addition to having several panic attacks, falsely reported in the media as his having an allergy to horses. During production, the script for the finale was altered when producer Robert Daley jokingly said that a train should crash through the barroom in the climax, and he was taken seriously by cast and crew, who thought it was a great idea. 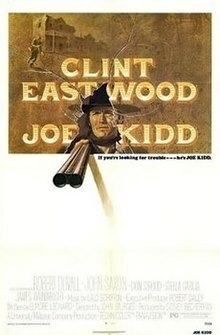 Joe Kidd was released in the United States in July 1972, and it eventually grossed $5.8 million. The film received a mixed reception from critics. Roger Greenspun of The New York Times wrote in his review of the film: "I think it is a very good performance in context. Like so many Western heroes, Joe Kidd figures even in his own time as an anachronism—powerful through his instincts mainly, and through the ability of everybody else, whether in rage or gratitude, to recognize in him a quality that must be called virtue. The great value of Clint Eastwood in such a position is that he guards his virtue very cannily, and in the society of Joe Kidd, where the men still manage to tip their hats to the ladies, but just barely, all the Eastwood effects and mannerisms suggest a carefully preserved authenticity." The New York Post praised the actors' performances while criticizing the film, calling the actors "diamonds set in dung". ^ Greenspun, Roger (July 20, 1972). "Joe Kidd (1972)". The New York Times. Retrieved January 23, 2010. McGilligan, Patrick (1999). Clint: The Life and Legend. London: HarperCollins. ISBN 0-00-638354-8.